Yes but the TRIN value fell off on the close. I'm down .5% on the SDS. As I mentioned the avg trade length is 2-5 days, so I am still hopeful the market will peter out. 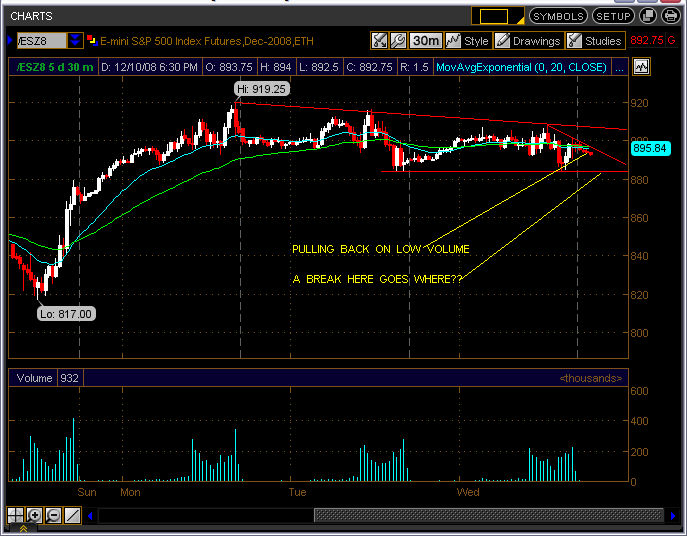 Trying again ... 892.25 RTH low to 904.75 RTH high projects to 872 unless 904.75 is taken out. Turk, overnight on the ES? VO, as I understand this, you take a prominent high to a prominent low and then factor in 261.8 and that gives a cycle prediction? yes and no...dont know what you mean when you say prominent but you are taking a pivot H/L and when the next retrace occurs you will use those two numbers...check out kools tools in "Articles"
I did but he references charts that no longer posted and it makes a hard read.